Backup to External Hard Drive. Portable external hard drive backup software. Backup files in real time to your hard drive. 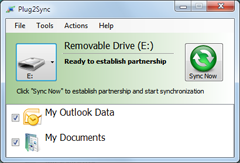 Plug2Sync and Backup is a simple, yet advanced, tool for backing up files and folders using an external hard drive. Make sure that your data is safe at all times and avoid data loss disasters. This real time backup software will synchronize files and folders with an external hard drive that you select. To make it the most efficient and reliable backup tool, the Plug2Sync and Backup software detects automatically when the selected external hard drive is plugged in and starts the synchronization backup process automatically, updating all the files and folders. To save your computer’s resources only the changes since the last backup are made. Plug2Sync and Backup is a reliable and versatile tool that can be used with portable external hard drives, USB flash drives, SD cards and any other removable storage devices recognized by Microsoft Windows. WD My Passport backup. Sync and backup with your Western Digital external hard drive. Use your Western Digital external hard drive to backup data from your computer in real time. WD My Passport backup: sync files from your computer and have them backed up on your portable external hard drive at blazing speed. Reduce transfer time by up to 3 times when compared to USB 2.0 transfer rates. Toshiba Canvio backup. Backup files using your portable external hard drive. Use your Toshiba Canvio portable external hard drive to backup files quickly and make sure your data stays safe. Toshiba Canvio backup: just connect it into the USB port of your PC and you’re good to go. Set up the synchronization backup once and you will have all data backed up automatically from then on, using the high transfer speeds of USB 3.0 technology. Seagate Expansion backup. Synchronize and backup files using your desktop external hard drive. Use Seagate Expansion desktop external hard drives to protect your important data effectively. Seagate Expansion backup: use Plug2Sync and Backup together with a Seagate Expansion external hard drive and ensure the maximum safety of your data at all times. WD My Book Backup. Use your Western Digital My Book to backup files in real time. Plug2Sync and Backup used together with Western Digital My Book can guarantee maximum protection of your files and folders. WD My Book backup: The WD SmartWare automatic backup software works quietly in the background to help protect your data using minimal PC resources. Whenever you add or change a file on your WD My Book hard drive, it is instantly backed up. Using Plug2Sync and Backup software will take your computer’s data protection one step further. You can synchronize automatically data from your computer’s internal hard drive with your portable external hard drive in real-time and make sure that all your important files and folders are automatically backed up to your WD My Book portable HDD. Seagate Backup Plus external hard drive backup. Effective synchronization backup. 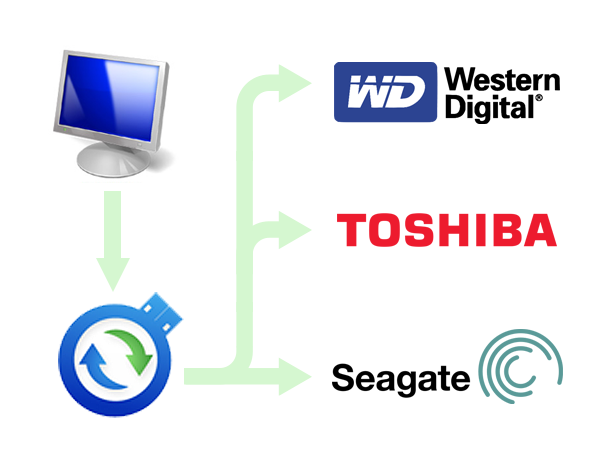 Plug2Sync and Backup, our effective synchronization backup tool, and Seagate Backup Plus external hard drive can offer an advanced backup solution when used together. The Seagate Backup Plus desktop drive lets you create custom backup plans to protect your files and schedule backups daily, weekly, monthly or at specific times. In addition to that, Plug2Sync and Backup lets you protect your files located on your internal disk drives by automatically synchronizing them with your desktop drive and backing them up as well, as soon as changes occur. This real-time sync and backup software solution is a powerful backup tool, and moreover, when coupled with a reliable external hard drive that comes with file backup solutions itself it can guarantee maximum protection of your data. You can read more about files and folders backup by going to the page: Real-time File Backup Software. Back up data to external hard drives or flash drives.